Typically when people think Bass Pro Shop, they think shopping, but Bass Pro Shop in Springfield Missouri is so much more. The boys had never been to Bass Pro Shop - that is until we made a quick road-trip to Branson, Missouri and decided to stop off at the Bass Pro in Springfield. The minute we walked through the doors their eyes begin to light up and their heads begin to spin - they saw things they never would have imagined - or saw things that made their imagination run wild. In my opinion Bass Pro Shop is different from any other outdoor company - they are more than just retail outlet - they are a destination. Inside their Springfield Store - known as the Granddaddy Bass Pro Store - is 7 large fish tanks, an Alligator Pit, and two museums - you could lose yourself easily, just don't lose yourself in the alligator pit. On the fourth floor of the store (yes there is 4 floors to this store) is the NRA - National Sporting Arms Museum and the Archery Hall of Fame - my two avid hunters could not pass this pass up, secretly nor could I. 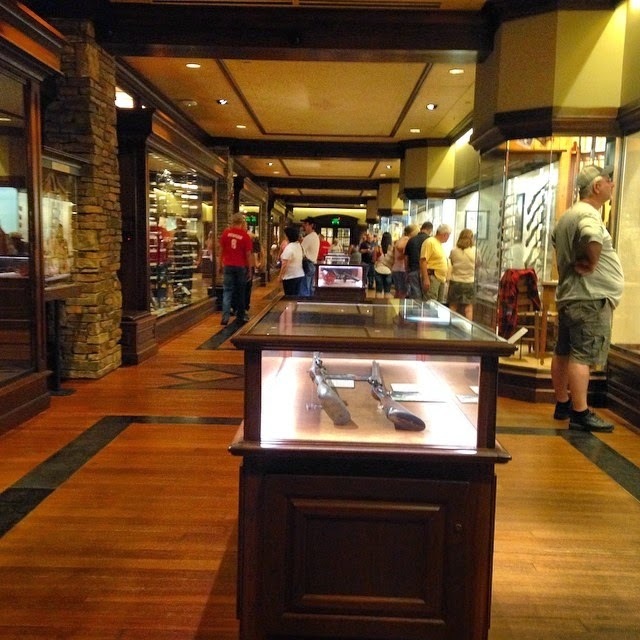 The NRA museum very well may have sent my boys in complete shock - there are very few places that you can find a museum completely dedicated to firearms and to top it off it is FREE to visit. I personally cannot tell you the difference between my 223 Savage and a Browning X-Bolt 308 - but the boys can tell me the difference in every gun there is. We spent hours, okay maybe not hours, but a long time staring at the guns, discussing what they may have used this or that gun for, and there very well may have been some dreaming going that day. 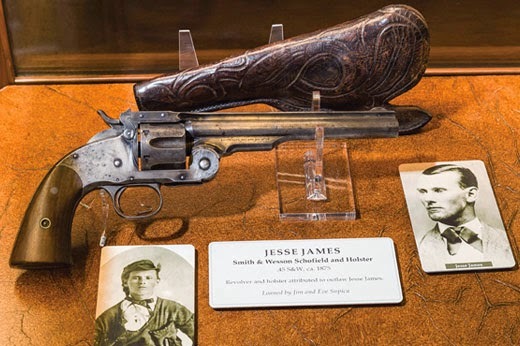 will catch your eye - The NRA Museum has a large display of firearms from famous people like Jesse James and Teddy Roosevelt - I am sure you could twist a history lesson into your visit also. The Archery Hall of Fame takes a historical look at archery in the U.S. - we often forget how important archery has been to our ways of survival years ago. Inside the Archery Hall you can learn about Fred Bear and other famous archers. You can also see an original prototype compound bow and Geronimo's bow and quiver that he handmade - pretty neat for history buffs and avid hunters! The boys love bow hunting and while they both agreed the hall was neat, they were more impressed with the NRA Museum - Guess nothing tops gunpowder and lead. If planning to visit any Bass Pro Shop, I suggest you check their calendar for events. Bass Pro offers many free events for families and visitors - giving each person a chance to learn more about great outdoors. Ummm- Yes I will! Thank you for posting this - I did not know you were in Sedalia, Missouri. Very Cool!